Looking to escape the congested tourist crowds in Zion? Pine Creek offers that escape. The Pine Creek Waterfall hike is a short but beautiful and fun hike to take your family on, and will help you escape the large crowds and tourists. The thing with Zion, is that everyone always wants to explore what has been explored over and over, and rarely take opportunities to step outside the “norm”. 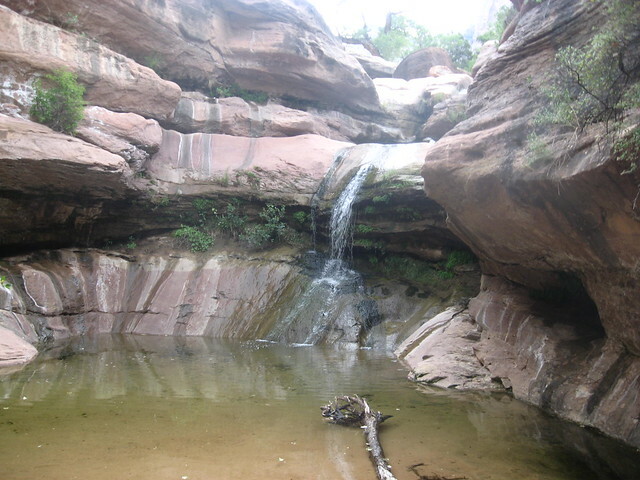 There is so much more beyond the more commonly known hikes like Angels Landing, Emerald pools, etc. Although those are all amazing hikes to try, they can be over-crowded and congested, due to how popular they are. This is a hidden gem that not many know of, and is perfect for cooling off and enjoying the short .25 mile hike to the fall. Prepare to remove your shoes and walk through water, boulder climb and maybe even swim, which is quite rare in Zion National Park. This is one of the better hikes for kids and families as it is short but offers plenty of obstacles to scale as well. This trail is easily accessed unlike others in the surrounding area making its appeal that much more! To get to the trailhead, go through the Mt. Carmel Tunnel, travel the steep switchbacks, until the road evens out, there will be a small turnout where you can park, if you see the junction, you have gone too far. On this trail be ready to see views of East Temple, West Temple, The Great Arch, Mount Spry and more! The great thing about Zion is there will always be something new to try, and something for everyone! Don’t be afraid to venture on passed the usual and more treaded parts of the park! Zion, no matter where you choose to hike, never ceases to amaze it’s visitors.